I’m doing my Advanced White Water Leader award some nine years after I last tried it but stopped due to not enough experience on higher grade water. I did the training last December and now I’ve redone the safety and rescue training which I last did in 2010. 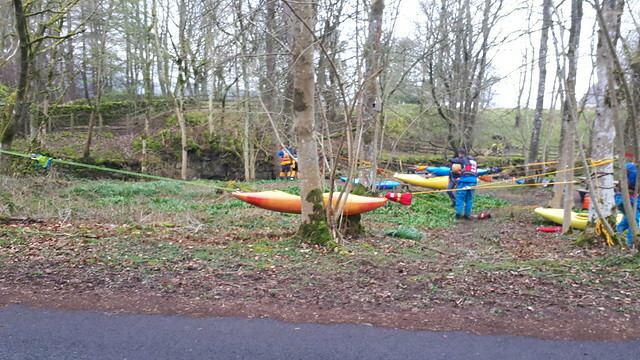 This is a two day course I did with Sean of Wildriver on the upper Tees at Low Force in Englandshire. It’s a scrapy river but served fine for the purposes of this course. Starts with knots and ropes on land. We looked at using trees as an anchor with a straight tie around using overhand knot and tape knot. Then 3 wraps, tie 1, hook 2. We looked at adding a line to pull on either direct, or at 90 degrees (less friction), adding an italian hitch to make it more controllable then making 2 to 1 pully, 3 to 1 pully, 4 to 1 pully, 3 to 1 with prussiks, adding a pully wheel to make it smoother, 4 to 1 with a pig rig. In England you don’t need to do a warm up before you get on the water, it is built into the activity as you run across the farmer’s field before he shoots you for trespassing. We moved onto the river and used the above to help move boats up and down a steep bank. We also looked at ways to control a person decending down a steep bank with a line down then angel wings (holding line under both arms), south aftrican (holding line around legs) or attached to the chest harness and let out from above. We went off syllabus and looked at paddle length and grip. I have a very very short paddle (185cm) because it gives the high cadence and agility needed for freestyle but a more normal white water paddler will use a longer paddle (190 to 210cm) for more power on the stroke as well as being able to reach maybe a boof which needs to be lower down. A WW or flat water racer will use a longer one still but that’s far too tiring for general WW boats. We looked at swimming over a current, this just needs a powerful front crawl. Any corkscrew is only if you don’t have the power to get over an eddy line. We moved to a faster rapid where the best technique to get across was a jump then swim. This depends on being able to know you’re not jumping into any rocks. The syllabus says you need to cover your face and crotch but it’s best to look like superman cos that’s cool. We looked at picking people up with a throwline. It is often easier to try to bring them in direct towards you than to pendulum them downstream of you as that exerts greater force on your line. We looked at live bait too where one person is attached to the throw line by their harness and jumps in to catch someone else, this needs some coordination such as who is holding the extra line to be released on jumping. For extra speed consider just walking or running away from the river when pulling someone/thing. We looked at picking up kit from the river including lots of live bait jumping. On day 2 we made a synch for picking people out the river, two throwlines attached in a circle. One way is both bags on either side, another way is both bags on one side. It’s faffy and the casualty will not make it easy because they’ll be panicking and it only works over a short distance. But it might be useful. We looked at in river rescues placing a person in the river using two throwlines on each bank and the person attached from the harness to both lines on a pendulum, Y and X formation. It’s hard work and needs coordination. We did a scenario with walking wounded helping them cross a river on a dual rope pendulum setup and moving them across rocky terrain. It’s hard work. The idea that you should hold a throwline with a grip of thumbs towards you is probably nonsense, use the best grip possible. To take my WW river paddling to a decent next level I need to get a new dry suit (current one is 3.5 years old and reliably leaks all over), a new paddle (current one too short) and a new boat (currently I borrow broken club ones). When Brexit happens and the pound collapses I will be able to afford all this.